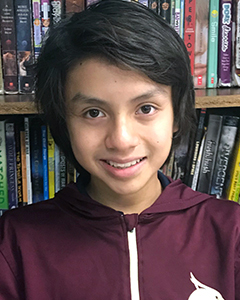 Blog :: Congratulations to December's Star of the Month: Erik B. :: Read Naturally, Inc.
Congratulations to December's Star of the Month: Erik B.
Erik B. is working for the win in his efforts to become a better reader, earning him the December Read Naturally Star of the Month award. Erik is a 7th grade student at Memorial Middle School in Edinburg, TX. Erik's teacher Ms. Salinas nominated Erik for his perseverance and positive attitude toward passing the TX State reading assessment. Ms. Salinas shared the following with us about Erik's recent success in his reading. "Erik is part of my 7th grade Reading intervention group. I see him for 30 minutes daily in the morning. Erik reads below grade level, but he works actively to meet his goals on Read Naturally. As a sixth grader, Erik failed to pass the state assessment. This year after only 4 months on the program, Erik met the state standard on a Benchmark assessment! As his fluency increases and his comprehension grows, his confidence has grown exponentially. As a natural athlete, he's says he approaches reading like another sport. Read Naturally to him is training for the state assessment! His positive attitude has influenced his peers to approach reading the same way. "